Not long ago, our local elementary school hosted a “Getting to Green” community event. My job was to work with my friend, Edie, an Audubon educator and farmer, to entertain the little ones while their parents listened to Dr. Halina Brown talk about “sustainable” consumerism. Edie, a spry elder with a twinkle and lightning-white hair, brought one of her chickens for the children to touch and hold. I brought one of my “systems playkits”. 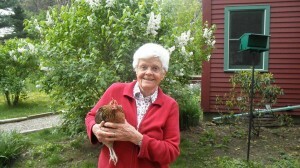 “Clucky”, Edie’s barnyard bantam, was a huge success. The children, ranging in age from 3 to 8, sat cross-legged in a circle, listening intently as she explained why a chicken has this part and that, what they eat, what color eggs they lay (Thoreaucana, a breed Edie developed, lays greenish-blue eggs. Dr. Suess would approve). No surprise. Most of the children bolted to the gym! (Note to self: Drop the word “system” next time). The few who remained gathered into a small circle on the floor. I showed them pictures of a chicken coop at Drumlin Farm, a local Audubon site. 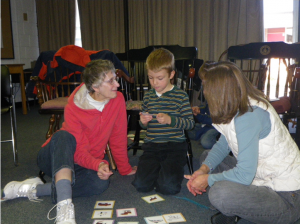 We laid out playing cards with pictures of chickens, cows, grass, manure, insects, decomposing soil, eggs, people, the sun, and more, and gave everyone a handful of wikki stixs, bend-able sticks made from hand-knitting yarn enhanced with non-toxic wax. We were ready to play. 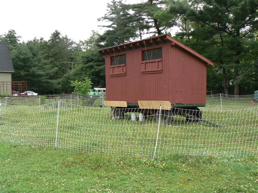 When they looked closely at the mobile coop they could see that this coop was unique: It had wheels! “Now, why would that be?” we wondered. Lilly, a bright and curious first-grader, had been to Drumlin Farm. She’d seen the chickens scratching the grass near the mobile chicken coop. “I know, I know!” she said. “The chickens eat the bugs in the grass!” Lilly grabbed a green wikki stix and connected chicken card to the grass card. I asked more questions: What happens to the chicken manure when it’s left in the field? 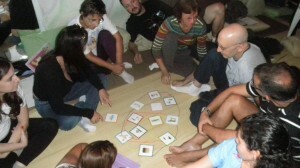 How are the chickens, the pasture and people connected? If you read the newspapers, you know that this statement is both timely and profound. Loss of topsoil and soil erosion due to over-farming and over-grazing of fragile soils is, according to The Worldwatch Institute, “A quiet crisis in the world economy.” The causes of soil erosion (expanding demand for food, short-cut farming practices) and consequences (silt-laden rivers, desertification) are complex. Said simply though, the more the soil erodes, the less productive it is. Without good topsoil, plants cannot grow. Systems Playkits, like the one I used with Lilly and her friends, have been used on farms, in public workshops, with a local girl scout troop towards earning their eco-explorer badge, and most recently with a group of 50 graduate students, studying sustainable development and education in Brazil. When I do, I understand. Working with the Creative Learning Exchange and Drumlin Farm, we designed the “Healthy Chickens, Healthy Pastures” playkit to encourage students to think deliberately about living systems in a farm setting. Through observation and play, the students discover the often hidden connections within the pasture and see the people, and wildlife around the farms, not as a set of interesting but disconnected parts, but as components in a vibrant living system. 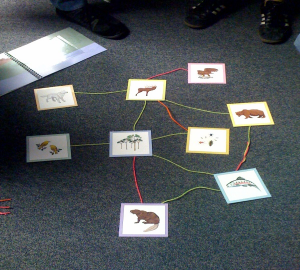 When used in educational settings, the game also provides students with an organizing framework (informed by system dynamics) to take home and apply in other contexts. 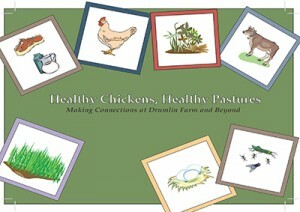 (The “Healthy Chickens, Healthy Pastures” playkit can be ordered through the Creative Learning Exchange). Many thanks to my good friends Gale Prior and Sara Schley for your thoughtful comments on this article. And to Ann Jennings (superb graphic designer), Renata Pomponi (Drumlin Farm) and Lees Stuntz (CLE) for our most enjoyable and fruitful collaboration!